I ran across this summary of a meeting on “What metadata is really useful?” hosted by JISC CETIS. While structured (administrative) metadata is less useful to me now than it was when I was working on IEEE LOM, the concept of data about the use of resources like MIT OpenCourseWare is of interest to me. * continue to build the resources with background information that I gathered for the meeting. * promote the use common survey tools, for example the online tool used by David Davies for the MeDeV subject centre (results here). * textual analysis of metadata records to show what is being described in what terms. * sharing search log in a common format so that they can be analysed by others (echoes here of Dave Pattern’s sharing of library usage data and subsequent work on business intelligence that can be extracted from it). * analysis of search logs to show which queries yield zero hits which would identify topics on which there was unmet demand. Phil has another post on “Analysing OCWSEarch logs” that is also interesting. An internal OEIT project to replace the video players in selected courses with SpokenMedia project player. An internal OEIT project to demonstrate search through SpokenMedia transcript files for delivery via MIT’s Google Search Appliance integrated with Greenfield OCW courses. A joint project with MIT OpenCourseWare to test OER Recommender/Folksemantic.com recommendations with select OCW courses. Here are the steps we used to prepare the i.Experience mirror of MIT OCW. This is our first second implementation of i.Experience. I originally started writing this post in April, but I’ve updated it to include the most recent changes to the mirror site. I expect to produce a new version of this guide in mid-/late-August as OCW issues a new version of their mirror. MIT’s OCW implementation uses MIT’s Google Search Appliance to support searching the OCW site. This Development Note discusses customizing this search mechanism to provide richer, more useful results. 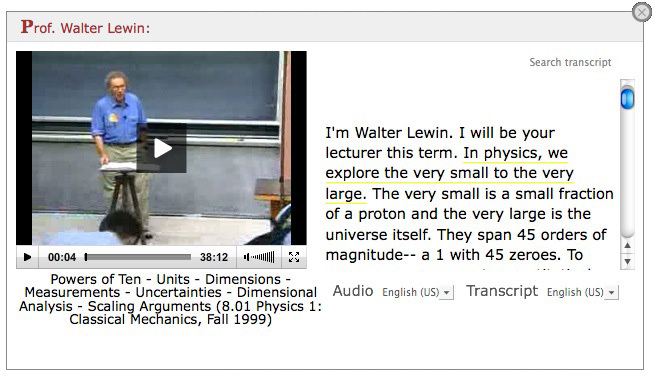 MIT’s OCW site contains static content. Unlike dynamic web sites where content can be assembled into a page on demand, each page at http://ocw.mit.edu exists fully formed waiting to be served. While this approach has advantages, it limits the ability of users to query specific results. The reason is that Google is simply looking for words; it doesn’t attribute any semantic meaning to these words. For the query “Marx”, Google depends on the user submitting the query to distinguish between Groucho and Karl. Use of MIT’s Google Search Appliance yields multiple benefits. The primary benefit is that it leverages the current solution to return a richer query result set. MIT’s OCW has very high standards for stability, scalability, and conventionality. A solution that used its current solution would make it more attractive for future adoption. Another benefit is the power of the Google search algorithms. After all, “Google” is synonymous with online searching. Brandon Muramatsu presented on the Greenfield project at the OCW Consortium Global 2010 Conference in Hanoi, Vietnam on May 5, 2010. You can also watch the OpenCourseWare Consortium published a video of the presentation. Extending the OCW Experience in the OCW Sandbox from OpenCourseWare Consortium on Vimeo. i.Experience is OEIT’s first forary into a new, “Interactive Experience” for OpenCourseWare and Open Educational Resources. Incorporate the SpokenMedia Player into the video pages. And…who knows, the sky’s the limit! The MIT Office of Educational Innovation and Technology (OEIT) has launched Project Greenfield in 2010 as an experiment to enable MIT faculty to explore how OpenCourseWare and Open Educational Resources might be used in new and innovative ways. *As of 2015, OEIT is now Strategic Education Initiatives (SEI), part of MIT’s Office of Digital Learning. We’re just getting started, and we invite you to join us on this journey.